When I first read about Marcella Hazan in the New York Times, I have to say I was skeptical. No olive oil? No garlic? Will my grandmother be angry? I hesitate to say a tomato sauce changed my life, but part of me kind of wants to make that claim – and if you make this you’ll see why. It’s hard to believe that the legendary Marcella Hazan – an award winning cookbook author who actually called Mario Batali on the phone just to tell him he’s making his risotto wrong – didn’t know how to cook when she left her home in Italy for New York with her husband in the 50s. 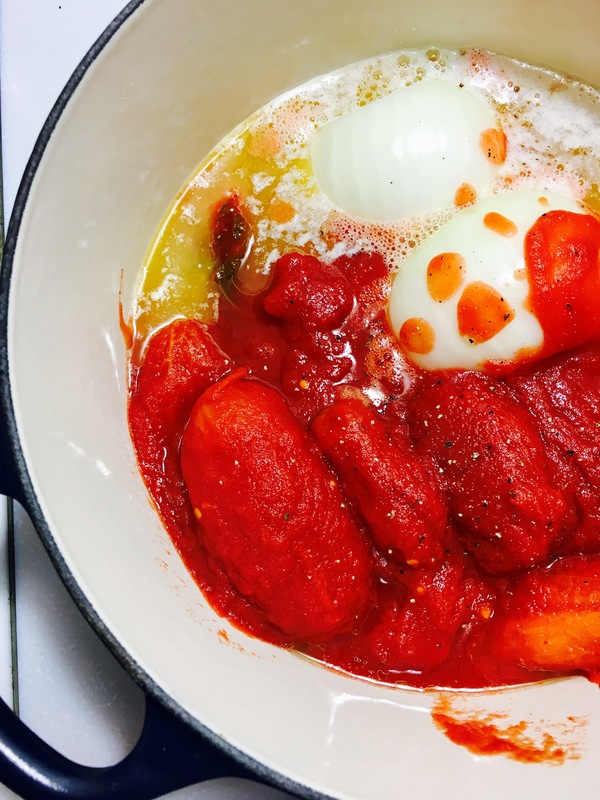 She was determined to make a decent meal for her new husband, and dove into any cookbook she could find – but she was disappointed by America’s take on Italian food. Whether it was the overuse of garlic, which she often criticized, or the lack of quality ingredients, it just wasn’t right. Hazan took it upon herself to show Americans real Italian cuisine. Relying on just her memory, she taught herself how to cook. Long story short – and six cookbooks and several awards later – Hazan became synonymous with Italian food in America. If you’ve never heard of Marcella Hazan, this dish is a perfect introduction. Like all of her recipes, it’s so simple – and with so few ingredients – that you feel like you’re reading it wrong: Half a stick of butter, one onion, and a can of tomatoes. I know. You’re confused. But just trust me on this. While delicious food really doesn’t get any easier than this recipe, quality of ingredients are especially important here. Try to find local onions. Stick with unsalted butter, organic if you can. Do not just pick any can of tomatoes. 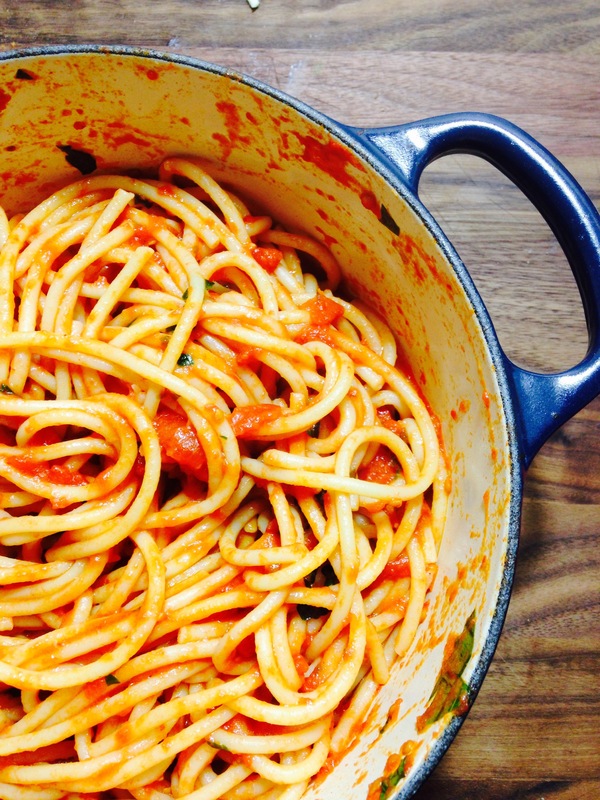 When I make my sauce, or any dish using canned tomatoes, I always use whole peeled San Marzano. You can also go traditional in this recipe, which would be perfect for a special occasion, and just pick out a bunch of fresh Roma (or plum) tomatoes from your local farmer’s market. This is a very popular technique in Italy, in which you boil whole tomatoes – a few at a time – for a minute until they split, before peeling the skins off. I learned this in cooking school when I was in Florence. It takes more work, but it’s totally worth it if you’re up for the task. All you need to do is simmer these ingredients with a little salt and pepper and you’re good to go. While Hazan doesn’t include fresh basil in her recipe– or even pepper, believe it or not – I always do. Consider it my personal touch. The day before her death, she enjoyed a pasta dish with her husband, like they did every single day together. She was 89 years old. Try to resist the urge for television when you make this dish, as I know we all can be guilty of. This is more of a dish for lingering. Perfect for quick family dinners or a romantic date night – and definitely as a it’s-just-me-but-I-deserve-this night – this sauce is brilliantly simple, rich and delicious. 1 28 oz can San Marzano tomatoes I use Cento. 1 lb. long pasta – my favorite for this dish is Bucatini. Leaving the basil for the very end, simmer all ingredients together for about 45 minutes. When pasta is al dente, add to pot along with basil. Toss well. Serve, and top with grated cheese. This looks amazing! 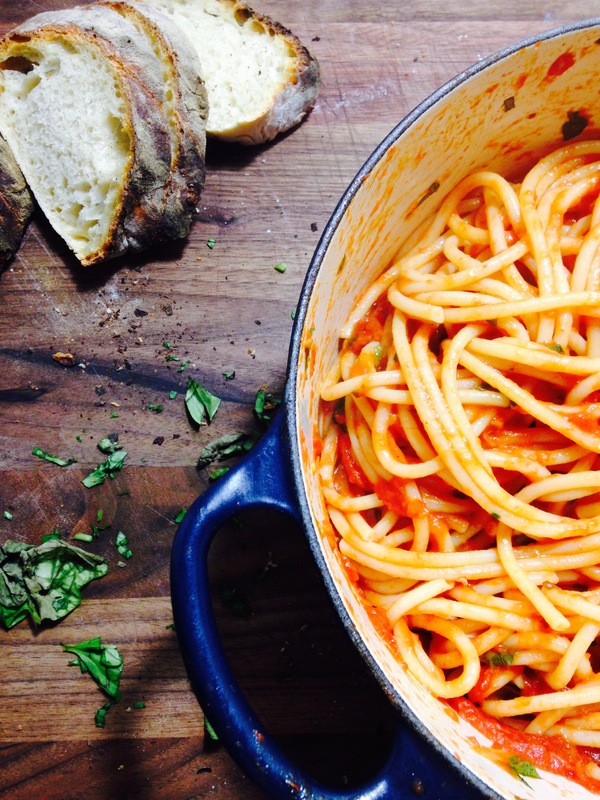 Love the idea of a simple tomato sauce. I’d add a little red pepper and call it perfect! This sauce changed my life. I was skeptical, but I tried it last night and it was awesome! Such a delicious, easy, lovely new go-to. We also used it as a base sauce for a veggie lasagna and it was absolutely fabulous. That’s a great idea! I use it as my go-red sauce for any type of pasta dish that calls for it — it’s delicious with meatballs too. I’m so glad you gave it a shot and loved it. Thanks for the comment!